The Tiger Mountain Trail, commonly known as the TMT, is a 16-mile trail that travels North-South through the Tiger Mountain State Forest. The TMT isn’t one long trail. It borrows its route from a few other trails, making it somewhat difficult to stay on course. In the remote Southern end, there are several junctions with no signs. In fact, the South entrance of the trail mentions nothing about the TMT. But don’t fret, this page is to help ease the fears of navigating the TMT. We’ve provided a trail map of the TMT, a video tour of the TMT, and below is a description of the trail from South to North. The start of the trail is on Tiger Mountain Rd. just North of the SR-18 and Issaquah-Hobart Rd. junction. It finishes at the High Point Trailhead. For solo runners, Uber or Lyft is about $26 ride back to the start. The start at Tiger Mountain Rd. is uneventful. The trail would be easy to miss, except for the trail crossing signs on the road. The shoulder leaves plenty of parking space. The single track trail begins through the forest of deciduous and coniferous trees. The trail is lined with ferns, shrubs, and decaying stumps from logging in years past. 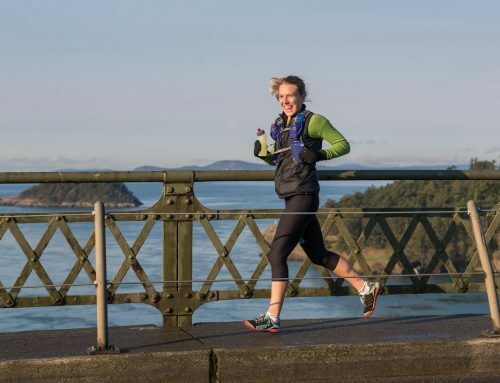 There is a faint noise of Highway 18 to remind runners that it’s not far from civilization. In just short of one mile is the first trail junction. It’s a horse loop designed to help horses from traversing the tough grade over the next quarter-mile. The first Tiger Mountain Trail sign is where the horse loop joins the trail again. It’s also called Hobart Gap. Follow the TMT through thick brush and jump over downed trees until the tall grassy area of the powerlines. This is the first confusing section of the TMT because there are no signs at these junctions. Turn right on the powerline road. Shortly after the turn is a grassy road. Turn left at this grassy road. Take the single track trail on the right after about 100 yards on the grassy road. This is 2.3 miles into the TMT. Be ready to be thorned by blackberry bushes at this point of the TMT. Don’t worry, the trail turns into a nice, pine and fir needle footpath shortly after. Giant cedar trees provide ample shade. In 1.5 miles is the logging road to South Tiger Mountain. The sign doesn’t mention TMT, but the route turns right. Follow the logging road for a short descent to the W. Side Rd. junction. Turn left and look for the TMT trailhead on the right. 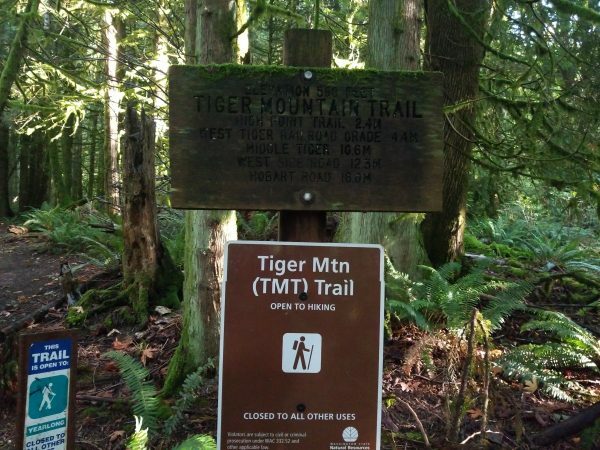 There is a Tiger Mountain Trail and Middle Tiger sign to reassure runners and hikers they are still on course. The trail climbs through replanted Douglas Fir trees from recent clear cuts until the trail crosses another forest service road. There are no trail signs, so the trail can be hard to see, but the trail is directly across the road. 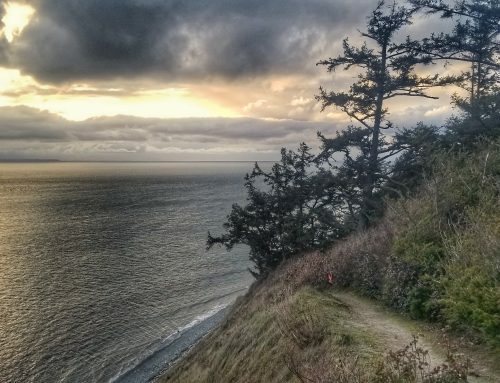 The trail finds its ways through some old growth, second growth, and recently planted forests. The TMT crosses the Middle Tiger trail at 5.3 miles. The elevation is at 2120 feet. With the skinny matchstick-type trees, this part of the trail can be mesmerizing. The trail descends every so slightly making it the best running section of the TMT. On sunny days, the contrasting light and shadows provide the backdrop of a laser-light show. The descent ends at Custer’s Bridge over Fifteenmile Creek, close to the halfway mark of the trail. Shortly after Custer’s Bridge is a huge boulder called Lone Rock. The TMT continues to the Hidden Forest Trail junction and the One View Trail junction, where the sign says 9.3 miles done and 6.7 miles to go. Poo Poo Point is a 1.3-mile climb from here for a trail detour and view of the Seattle area. 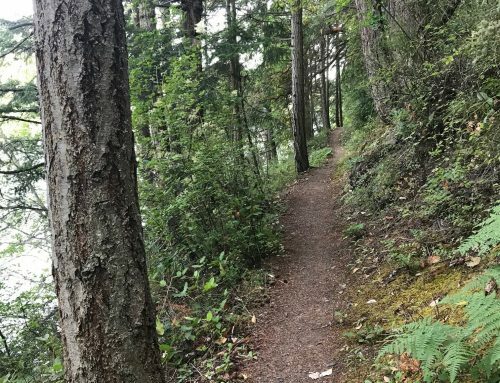 The trail gently climbs another mile toward the West Tiger 2 and 3 trailheads. Both peaks are just a short climb from the TMT. At 2580 feet, this is the highest elevation point of the TMT. 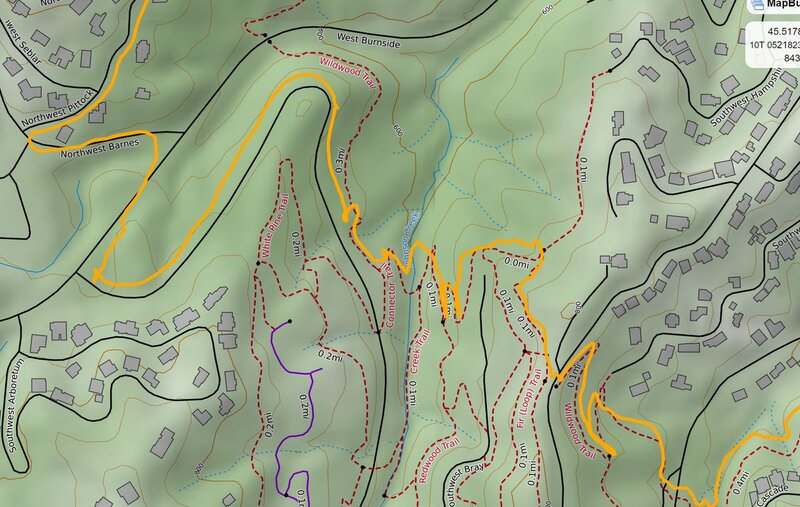 Enjoy several rooty switchbacks for a half-mile descent. 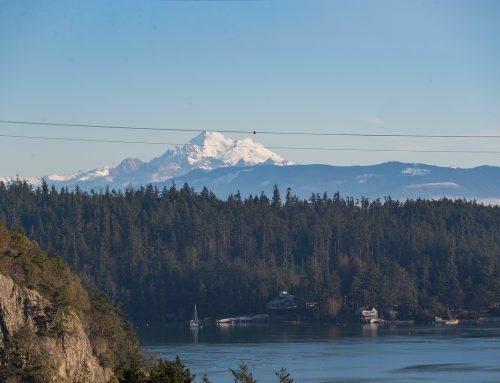 Several breaks in the trees present views of Seattle suburban life. Then the trail gets to another confusing junction. After passing the K-3 trail, the TMT “borrows” the West Tiger RR grade trail. At 11.5 miles, there is a small paper sign that explains a new route, but it’s easy to miss. Previously, the TMT turned at Fred’s Corner shortly after the sign. However, a new route continues on West Tiger RR grade trail to a new section of the TMT about 200 yards after Fred’s Corner. This should be the last tricky part of the TMT. At 13 miles into the journey is a quaint area called Ruth’s Cove. Continue on the trail past the Lingering Trail and High Point Trail over to Murat’s Bridge, a new bridge over High Point Creek. The trail climbs a bit to the lower end of the K-3 trail (a short-cut if needed) and crosses over a couple more wooden bridges. 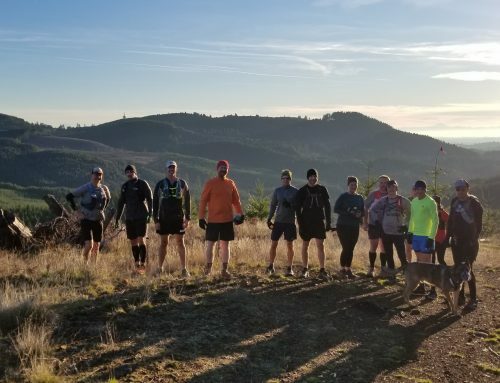 The unmarked Cable Line Trail is at mile 15.3 and the trail descends 900 feet to the High Point Trail and the end of the 16-mile Tiger Mountain Trail. Turn right for the short run to the High Point Parking lot.